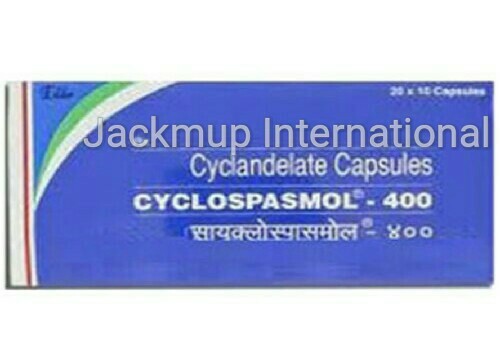 Description:- Cyclospasmol 400mg capsule is used in the treatment of pain due to smooth muscle spasm.It belongs to the group of medicines called vasodilators. It works by dilating the blood vessels which allows the blood to circulate easily. Consult your doctor if you are suffering from severe blockade of the blood vessels (coronary arteries) supplying oxygen-rich blood to heart (coronary artery disease), peripheral or cerebral vascular disease, increased pressure inside the eye that causes visual problems (glaucoma) and bleeding or blood problems. Seek immediate medical attention if you develop severe allergic reaction such as difficulty breathing, swelling of your lips, tongue, or face. Cyclandelate should be taken with food or an antacid to avoid stomach upset. Take precautions while using cyclandelate, as you may feel dizzy especially when you get up from a lying or sitting position. Side Effects:- Palpitations, Increased heart rate, Arrhythmia, Excessive thirst, Reduced bronchial secretions, Dry mouth, Photophobia, Dry skin, Loss of accommodation, Slow heart rate, Flushing (sense of warmth in the face, ears, neck and trunk), Dilatation of pupil, Difficulty in urination, Constipation.